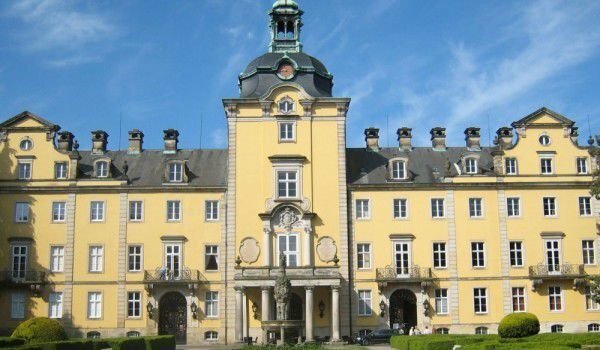 Bückeburg Palace is located in a picturesque small town 30 km north of Hanover. With more than 700 years of history behind Bückeburg, today it is one of many places in Germany where you can learn about history and gain a real impression of the brilliance and power of the ruling German families. Today Bückeburg is an inspiring and beautiful palace complex, residence of the Princes of Schaumburg-Lippe, who after their withdrawal from power in 1918, lived in the castle. The original castle was built around Bückeburg, in 1304, when it is first mentioned in historical documents. Graf Adolf VI’s family of Schaumburg Medieval fortress stands here, which is a type of water castle. The palace had a major task to control the important trade route Hellweg. Near the castle began to develop a small village, which over the centuries turned into a city. This does not mean anything special, at least to the management of Ernst Schaumburg, which is probably the most important historical figure from the ruling family. Between the years 1601-1622 Bückeburg became the residence of Ernst, which gives the town a city status, many new buildings were built in the village, along with roads. From this period is the church facade (1612), which is considered to be unique across northern Germany. Changes in the structure of the palace Bückeburg made during and after the reign of Ernst Schaumburg. Significant improvements in the palace are made in the following centuries, and today Bückeburg is a true gem of Baroque architecture. The fabulous Banquet Hall, crafted in the rococo was completed in 1897. The room is simply gorgeous with its lavish decoration and impressive size (9 feet, 12 meters wide and 24 m length purposes). At the same time the massive reconstruction of Bückeburg Palace (between 1893 and 1896) is made with a modern kitchen that can accommodate 250 people. Improvements were made in the beautiful gardens of the castle, where, new pavilions, flower walks, etc. can be found. In Bückeburg, Alexander Prinz zu Schaumburg-Lippe lived. From 1925 there were separate rooms, a large Banquet Hall, Golden Hall and Schlosskapelle, which are available to the public. Since 2004 this is an art school. Parallel to this, Bückeburg Palace regularly hosts many festivals and exhibitions. In the castle can be seen an incredible number of art objects. In the vast spaces of the kitchen is now a nice cafe-restaurant, where guests can enjoy the castle and fine cuisine. On all sides Bückeburg Palace is surrounded by 3 beautiful parks and gardens, situated on 40 hectares. They also have a lot to see - various statues and sculptures, and a 25-meter tree (Mammutbaum), located behind the Mausoleum in the park. Today many young couples in love choose to hold their wedding in the beautiful and elegant atmosphere of the palace Bückeburg. Favorite is the Golden Hall, where almost every inch is covered with precious metals.